Creating areas with different surface textures. In Aruba having a lawn or even a patch of soft grass is out of the question, so creating areas with sand, rocks, and weeds is as good as it gets for us. This little island of rocks seems very inviting and fun for climbing, or just contemplation. 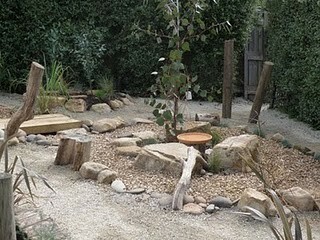 The use of rocks to create an impression of water is something that appeals to me as well. 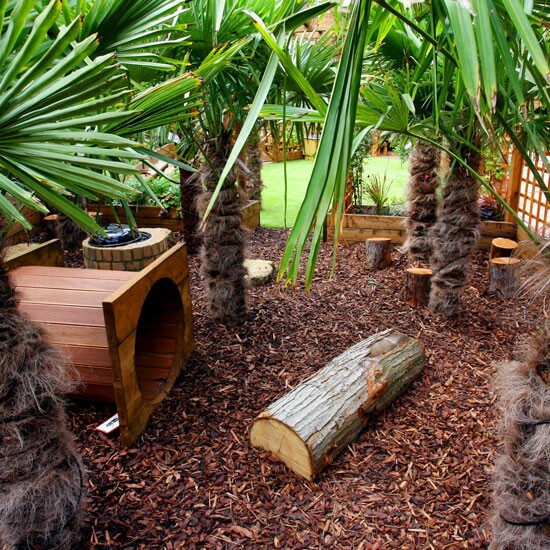 Mulch is another surface area that's available for us. I'm going to section off a small area under a tree to be a building area with our very large home-made (construction salvaged wood) blocks. I love this little tunnel and the feel of this small play area. Small spaces to crawl into and hide are great. 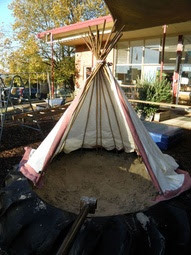 We have a small wooden playhouse that three children fit in comfortably, but this recycled tire tepee seems like a winner. In our incredibly windy environment the sheet around the bamboo might not be possible, but I will try with a porous garden fabric. This idea seems pretty great for partitioning off areas of our space. 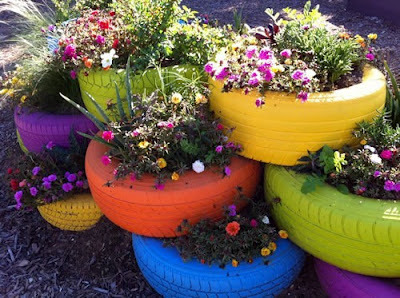 We can plant low maintenance wild flowers in the recycled tires after painting them. This morning we put up two large plywood sheets along the fence, and tomorrow I will paint them with dark green side walk chalk. 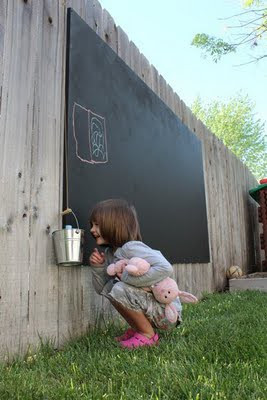 I am very excited to have such large and inviting chalkboards outside! I love the idea of the dangling bucket for holding the chalk. I'd love to have a set of uniform brick-like blocks like this, but am happy with our construction grade salvaged wood blocks that I made earlier this year. I will add some sanded boards as well so that perhaps improvised see-saws or other inventions can be built. Places to ponder and just observe are as fundamental as places for movement. We've made driftwood furniture for our home, but I never considered making something for school. 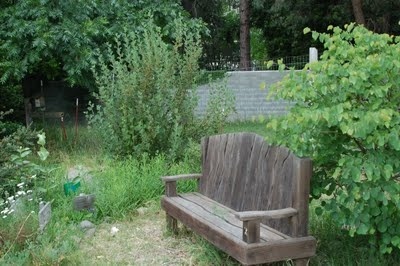 This bench is totally inspiring. There are so many possibilities in a garden!!! 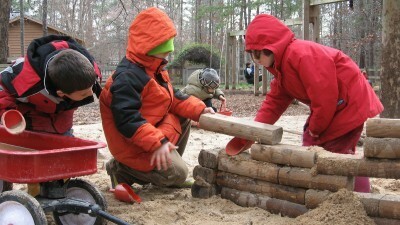 Simple natural materials are so attractive and the children love exploring, inventing, etc... 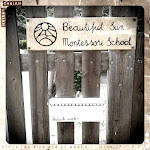 There are so many things I want to do with my garden too.... Another month before we open preschool again! Fingers crossed, might find The time to do what I want to do!! Love your blog! Have been following your for a while and It is always nice t see what people with a small preschool across the world do in their classroom!! Looking forward to your next post!! Greetings from Ireland! !